Famous for playing athletic roles in movies for which he has been outstanding, Robert Ri’chard gained popularity for the excellent display of his athletic prowess in movies such as Coach Carter. He is well-known in the movie industry for the relative success he has been able to achieve at his age. Kick-starting his acting career at the age of 13, Ri’chard has featured on numerous movies and TV series. He bagged Daytime Emmy Award for Outstanding Performance in Children’s Special with the movie, In His Father’s Shoes. He has also worked as a producer with the movie, Otto as his production credit. Read on to find out more facts about the sensational actor’s life and family. Robert Ri’chard who is of African-American ethnicity was born in Los Angeles California, the USA, on January 7th, 1983. He is of American nationality and belongs to the descent of Louisiana Creole of African-American. Details of his parents identities and that of his siblings are not yet known. Ri’chard attended Palms Middle school in Los Angeles, California. He completed his higher education from Loyola Marymount University. The famous actor is an ardent sports fan and he loves playing basketball, baseball and football. He was a great basketball player before he decided to pursue a career in acting. The award-winning actor made his introduction into the movie industry at the age of 13. Since then, he has gone ahead to win the hearts of millions with his stunning performances. However, Robert Ri’chard made his movie debut in Light Up, where he featured alongside the prominent R’n’B singer, Usher Raymond. The handsome actor who stepped into the acting stage in 1993, was publicly recognized with an award just after five years of kick-starting his career as he clinched the Daytime Emmy Award for Outstanding Performer in a Children’s Special in 1998. He followed it up with another appearance in Alley Cats Strike, a Disney Channel TV movie, two years later. Furthermore, 2005 is a year the American actor will definitely not forget in his life, as he made one of his major hits. Ri’chard was featured in two blockbusters movies, Coach Carter and House of Wax, which globally announced his presence in the industry. His jaw-dropping performances were thereafter seen in movies such as, The Feast of All Saints, Who’s Your Daddy, The Comebacks, Throwaway Holiday and Chocolate City, where he starred along with Vivica Fox. With reference to his TV shows, Ri’chard made his debut on the TV sitcom, Hangin. He further went on to appear in the Nickelodeon TV show titled Cousin Skeeter, alongside Megan Good and Angela Means. He also landed a recurring role in Figure it Out, a Nickelodeon game show. Robert garnered much popularity with his brilliant display of the character, Arnez Ballard in the mega-hit sitcom, One on One, alongside Kyla Pratt and Flex Alexander. This TV show earned him his first breakthrough in the movie industry even though it ended in 2006. A few years down the line, Robert Ri’chard was announced to be among the cast of the popular TV series, The Vampire Diaries as Jamie. With this role, the award-winning actor has clearly established himself in the movie industry. Having been in the industry for over 2 decades, Robert Ri’chard has amassed great wealth through his acting career. The award-winning actor is estimated to be worth around $400,000. As mentioned earlier, the identities of Ri’chard’s parents are yet unknown, but it was reported that his father was a basketball player and his mother, a gym instructor. Concerning his love life, Robert has been linked to several women over the years. However, he is known to have dated two of his co-star actresses, Kyla Pratt and Vivica Fox. His love affair with Kyla began in 2003 when they were working together on the set of the TV series, One on One. In the following year, the duo called off the relationship for reasons best known to them. 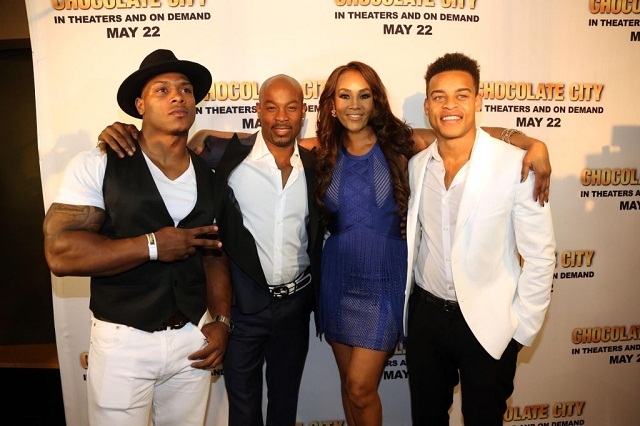 Just like his previous relationship, Robert Ri’chard met Vivica Fox on the set of Chocolate City, where she played the role of his mother. Soon after that, the pair were reported to be dating, this news actually caused an uproar on many celebrity news sites as the actress is 20 years older than Ri’chard. The couple dated for a year before heading their separate ways. The handsome actor is currently not yet married. He is still single, believing to find his soulmate anytime soon.